Invisible braces like Invisalign are becoming ever more popular, especially among adults. They are a great option for people who want to straighten their teeth while avoiding a ‘metal mouth’ smile. But how much do invisible braces cost, do they really work, and which is the best brand? In this guide we will answer these questions and more so you can make an informed decision about the right orthodontic treatment for you. You can read about some of the most popular brands of clear aligner brace in the UK, plus find out how much you can expect to pay for your treatment. 1 What are invisible braces? 1.1 Why are they so popular? 2 How do aligner systems work? 5 How much do invisible braces cost? 5.1 Can you get invisible braces on the NHS? 5.4 What’s the cost of clear retainers after teeth straightening treatment? 6.1 Which is most effective? The term ‘invisible braces’ refers to a way of straightening teeth that uses a series of clear plastic aligners (also known as ‘trays’) to gradually move teeth into the alignment. You may also hear them called ‘removable braces’, although the correct term is ‘clear aligners’. Although they aren’t completely invisible, they use advanced technology which makes them barely detectable. Most people can’t spot that someone is wearing clear aligners until they are told. The best-known type of invisible brace in the UK is the Invisalign clear braces system, but other similar brands are also available. If you’re wondering how to choose between the different types of invisible brace, we’ll cover these later in more detail. They may also be a good choice for people whose teeth have started to move back to their original position following previous orthodontic treatment. Invisalign invisible braces can be used to treat around 90% of orthodontic cases – only the most severe will require another type of brace. You can find out if you’re eligible for Invisalign treatment in under two minutes by completing a free Smile Assessment. Click the button below to get started – it takes less than two minutes to get your results. 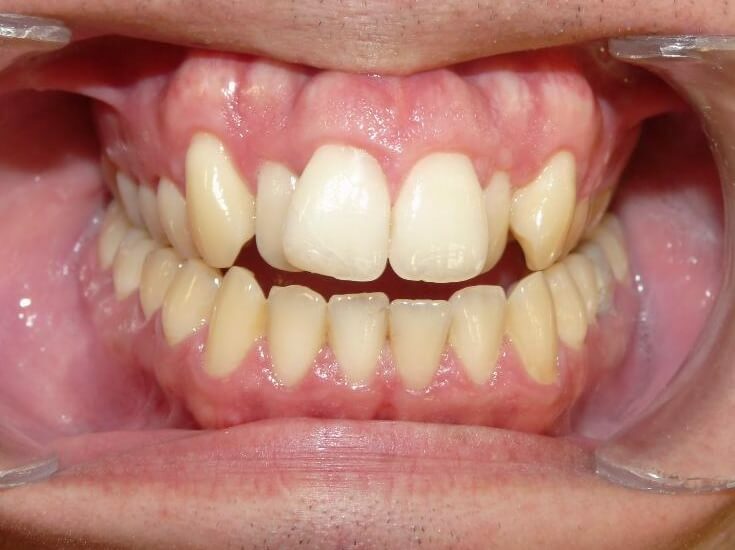 Although relatively new to the market, invisible aligner braces have become very popular very quickly as they offer an inconspicuous way to achieve a better smile. Many adults decide to wear braces because they feel uncomfortable with the way they look. But did you know that having misaligned teeth can lead to dental problems later in life as it’s harder to keep them clean? Because of this, invisible braces can be considered an investment not just in your smile, but in your oral health as well. Transparent braces are a popular choice with professionals who worry that more visible braces will cause them to be taken less seriously or even teased at work. After all, don’t we most commonly think of school children wearing braces? Although this stigma is lessening, it’s understandable for people to feel self-conscious about wearing braces in adulthood. Another reason why people may opt for this mode of treatment is if they have a big day coming up, like a wedding. Many brides would consider their wedding photos ruined by a metallic smile, so instead choose transparent braces. Some adults and teens may also play a contact sport or a wind instrument where traditional braces are not recommended. If you’re interested in Invisalign braces for you or your teen, it’s easy to find your nearest provider and book your first appointment online. Locate an Invisalign dentist near you using the button below. How do aligner systems work? Your dentist or orthodontist will begin your treatment either by taking a mould of your teeth which can be used to create a digital scan, or by scanning your teeth directly using the latest imaging technology. This scan is used to plan your treatment step by step with the help of a computer program. From this, your aligners are created. The 3D plan lets you see ‘before and after’ views of your teeth before the treatment has even begun. This allows you and your dentist or orthodontists to visualise the predicted outcome of your treatment and discuss different treatment options you may want to consider. It may be necessary for you to have your teeth filed along some sides as part of your treatment. This painless process creates tiny gaps between teeth to give them space to move, and it can also even out cosmetic imperfections. Each aligner is customised to fit your teeth and shaped to apply pressure in exactly the right places to slowly shift them into alignment. You’ll need to switch to a new aligner every one to two weeks, depending on your dentist’s recommendation, but this doesn’t mean having checkups that often. Your dentist or orthodontist will only need to check the progress of your treatment every four to six weeks or so before providing you with new sets of teeth aligners. Treatment can take anywhere from nine months to 18 months or more, but typically lasts just over a year. Since longer treatment requires more trays to be made, the price of invisible braces increases considerably for longer treatment durations. After treatment with clear aligners, you’ll need to wear a retainer at night to keep your teeth in place. Your orthodontist or dentist may recommend wearing it during the day at first, too. Invisalign retainers, branded as Vivera retainers, are designed to be almost unnoticeable. Other types of retainer use metal wires to keep your teeth in place, but are still removable. It’s possible you’ll need to wear a retainer for the rest of your life to stop your teeth moving out of alignment (known as relapse). The brand Invisalign is almost synonymous with this kind of orthodontic treatment, so we’ll begin here. Align Technology, the company behind Invisalign, was founded in 1997. The product hit the American market with full force in the year 2000, backed by a persuasive marketing campaign. Up to then, there had been very little innovation in the orthodontics market, except for lighter and whiter materials being developed over the years. All braces used essentially the same system of wires and brackets attached to teeth. So when the ‘invisible brace’ concept first appeared, it offered a completely new way to subtly straighten teeth. The original invisible brace has now made a worldwide name for itself. Align Technology started with just one product – now known as Invisalign Full – but has since then developed a range of other products to treat different cases. In December 2018 the company began treating its six millionth Invisalign patient – quite an achievement! This is the most common Invisalign treatment, used to correct more complicated problems with tooth alignment. 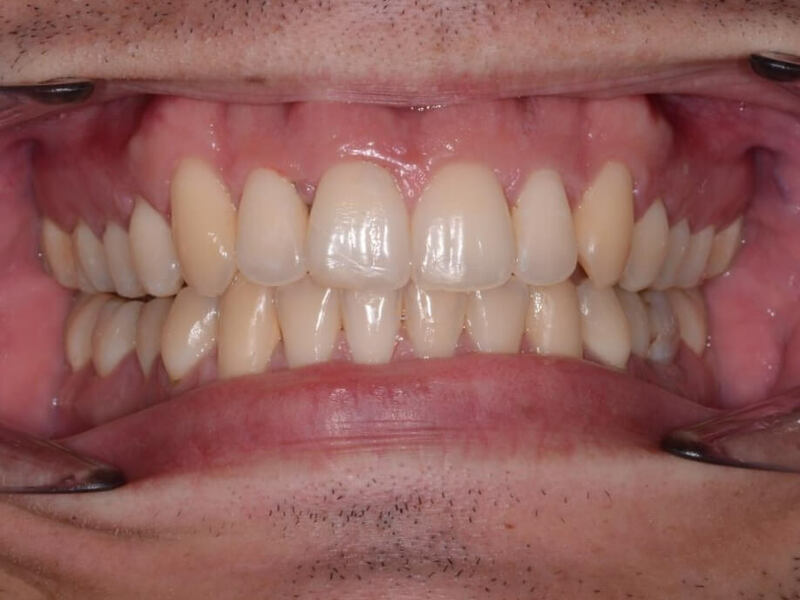 Full treatment usually takes 12-18 months but will continue until the desired result is achieved. For minor to moderate cases which don’t need Full treatment, there are two shorter treatment options. Invisalign i7 is used for minor dental corrections, often for aesthetic reasons. Using just seven sets of aligners, treatment can be completed within as little as three months. Lite treatment takes a little longer – around seven months. 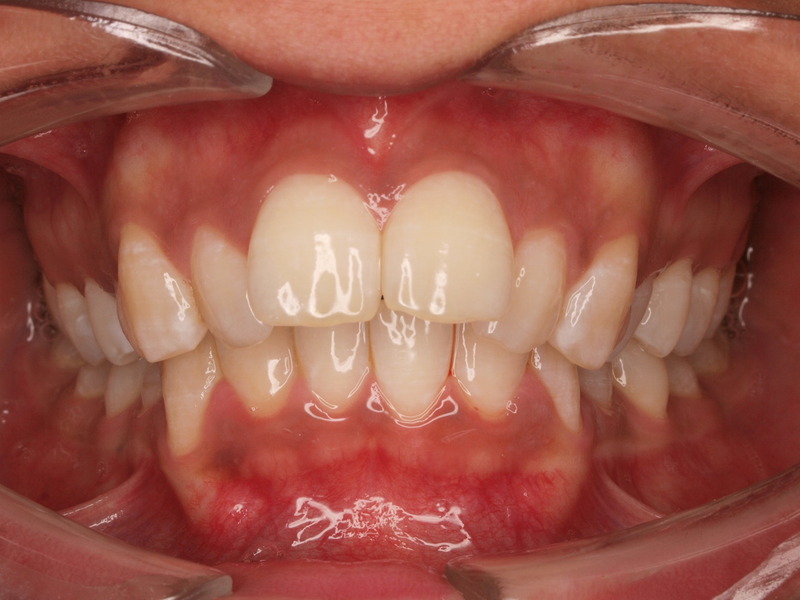 Because teeth and jaws are still developing during teenage years, it’s a great time to fix any alignment problems. However, some brands of invisible aligner braces are not designed to accommodate the growing jaw of a teenager. With removable braces there is also the risk that the patient will be tempted to remove them for longer than the recommended time each day. Invisalign braces aren’t available on the NHS, but in the case of Invisalign Teen, some parents may say it’s a small price to pay for their child to have a straighter smile without the risk of bullying and name-calling that often comes with wearing braces. The system is also a good option if their child plays a contact sport or a wind instrument. To find out whether your teen’s teeth can be treated with clear aligners you’ll need to have a consultation with a dentist or orthodontist offering this treatment. It’s simple to find an Invisalign dentist near you and even book an online appointment – just click the button below to get started. Treatment for adults with Invisalign braces costs a little more than with traditional braces, but again, discreet teeth straightening is something many people are happy to pay a little extra for. You can read more about invisible brace prices and options for NHS treatment further down this article. 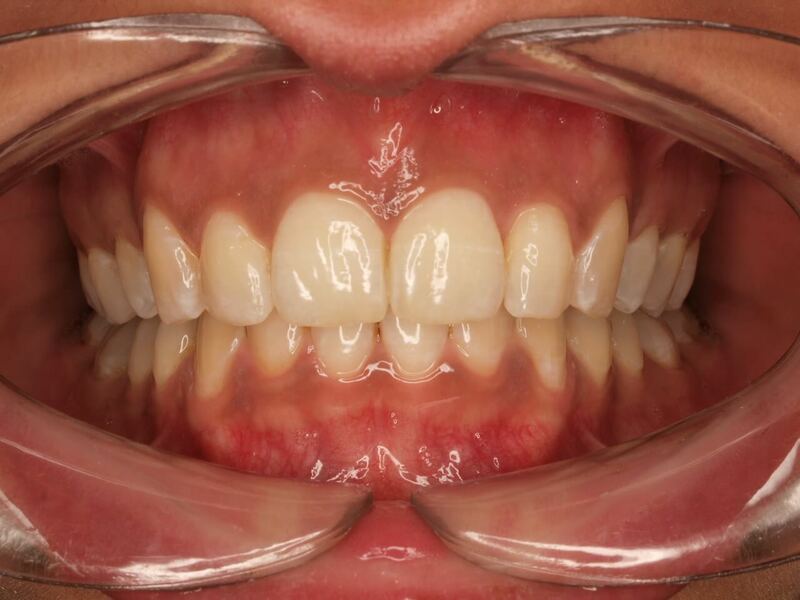 These before and after photos show how effective these invisible aligners can be at correcting the position of teeth. If you want to know what other people think of using Invisalign clear braces, there are plenty of review sites where you can get an honest opinion of the process and view ‘before and after’ photos. If you’re short on time, check out our Invisalign reviews article which summarises honest reviews from real users. Some people report mouth sores, ulcers and bleeding gums in the first few days while their mouths adjust to the trays. Others say they have difficulty removing them at first, but most people soon get used to them and have a positive experience. “I have around 12 attachments and although tray change days are a bit uncomfortable for a couple of days, the process has been pretty easy! Anyone thinking about straightening their teeth, just do it! I wish I’d done this years ago!” said one user from North Lincolnshire. “The pain this time around is a little more intense, mainly when trying to take the aligners out to eat, as my teeth are very tender and the aligners are hooked onto the attachments.” was the response of a reviewer in London who had just had attachments fitted to her teeth. The inconvenience of having to remove the teeth aligners every time you eat or drink anything except water can be annoying, but on the other hand you don’t have the fiddly cleaning of metal braces to deal with. Invisible aligner braces won’t be the right choice for everyone, so it’s a good idea to read some reviews for yourself before making a choice. And don’t forget to take the Invisalign Smile Assessment for free to find out if you or your teen are a suitable candidate for Invisalign treatment. Invisalign has arguably the best reputation in the UK and brings 20 years of expertise to the market. However, your local dentist may also offer other aligner brace solutions including those mentioned below. Keep in mind that some companies – particularly newer ones – may not have invested as much in their research and technology, so you should consider this when making your choice. ClearCorrect, probably the next biggest name in aligner orthodontics, released its first product in 2006. All ClearCorrect braces are manufactured in Texas and shipped out to dentists in the US, the UK, and Australia. A dentist uses impressions or a scanner to capture the current position of the patient’s teeth before creating a treatment plan. Patients must wear their aligners for at least 22 hours every day. Treatment may take anywhere from a few months to a few years, depending on the complexity of the tooth straightening required. British Croydon-based company ClearSmile offers a variety of adult braces, including ClearSmile Brace and ClearSmile Aligner. The ClearSmile Aligner focuses on straightening the front 8-10 teeth. Treatment with ClearSmile aligners begins by taking impressions of the teeth. These are then analysed using Archwize software which produces a diagnostic report. This report allows patients to see ‘before and after’ views of their teeth on 3D animated models before treatment commences. The ClearSmile production method combines 3D printing and moulding to ensure a close and comfortable fit for the patient. Further impressions may be taken every six aligners to ensure that the teeth are moving into place as intended. This treatment is widely available in the US and has recently been introduced to the UK market. The Inman Aligner offers a slightly different take on the clear aligner brace. Using patented technology, the spring-loaded system applies pressure to the front and back of the teeth simultaneously to bring them into line. Treatment usually takes 6-18 weeks to complete. This treatment only works on the front teeth, so unlike Invisalign, it’s not a full orthodontic solution. Patients are often people who wore braces when they were younger but now have crooked teeth again because they stopped wearing a retainer. Inman aligners only have to be worn for 16-20 hours a day, which is less than other styles of aligner brace. On the downside, Inman aligner braces aren’t really invisible. Although the ‘bow’ which spans the front teeth is made from clear plastic, it usually has a wire running through it. The metal springs and clasps which attach to the rear teeth are also quite visible when you smile. Some orthodontists offer more than one brand of invisible brace, so you can ask which one they recommend for your treatment, and why. It’s worth noting that some Invisalign reviews suggest people experience greater comfort from this brand because of the material and the way it fits around their gums. If you have already decided that you want to use Invisalign, click here to find your local Invisalign dentist and book an appointment. In most cases, invisible braces cost slightly more than the traditional metal ‘train track’ alternative. However, it’s a price most people are willing to pay for the benefits of having their teeth straightened discretely. The price that orthodontists charge for each type of brace is up to them, so you’ll find that charges differ from one location to another. The cost of Invisalign and other transparent braces will also depend on the complexity of your treatment and the expected duration. If you are a suitable candidate for Invisalign Lite, for instance, the cost will be lower than if you needed Invisalign Full. As a rough guide, we can say that Invisalign costs around £1,500 – £5,500 in the UK. It’s a broad range because of all the variables involved. The best way to get an accurate quotation for your treatment is simply to visit an Invisalign orthodontist for a consultation. Click here to find your nearest Invisalign provider and book an appointment online. Can you get invisible braces on the NHS? No, invisible braces like Invisalign are not available on the NHS. Only traditional metal braces are offered on the NHS to qualifying patients; usually children and teens under 18 who have a clinical need for orthodontic work. If you or your teen want invisible braces, you will have to pay for them privately. There are lots of things to consider when deciding on the best kind of braces for you. For most people, cost, appearance and comfort are the most important factors. So how do invisible braces compare to other types in terms of cost? As you can see from the table below, the cost of Invisalign is similar to or less than other discreet alternatives such as ceramic braces and lingual braces (more about these options further down). You can find more information about the different types of braces in our full guide to braces for adults and teens. If you’re putting off treatment because of the cost of invisible braces, your dentist may be able to help you spread the payments out. Many Invisalign dentists offer Invisalign payment plans for UK customers as well as free initial consultations. Dental payment plans allow you to pay a deposit up-front and then pay off the remaining amount during your treatment. If you’re considering using finance for dental treatment, it’s worth shopping around for a dental practice that offers 0% finance. This can make a big difference to the total cost of your invisible aligners. Your health or dental insurance may well provide partial coverage for orthodontic work for under-18s. Adults are less likely to be covered, although more providers are starting to expand their dental insurance offering to include orthodontic work. Check your policy for details, and take note of the percentage covered and the lifetime maximum per person insured. Be wary of switching providers half way through orthodontic treatment, as the new policy may not cover work that has already begun. Your dentist may allow you to pay a portion of the cost via your insurance policy and then use a payment plan for the remainder; this might be the most affordable way to get invisible braces. What’s the cost of clear retainers after teeth straightening treatment? When your orthodontic treatment has finished you’ll need to keep your teeth in place with retainers. Invisalign retainers are available under the brand name Vivera. These can last anywhere from a few months to a few years, depending on how well you look after them. The cost of Vivera clear retainers will vary from one dentist to another, but can be around £250 for a set of three for one arch (jaw) and £450 for a full set of three in the UK. A similar style of retainer, called an Essix retainer, is available from most dentists at a more affordable price. Hawley retainers, which use acrylic and wires, are another option. Whichever type of retainer you choose, you’ll need to factor in the lifetime cost of using one when budgeting for your orthodontic treatment. If you stop using a retainer, your Invisalign results will recede. That final point is very important; people who may be tempted to skip a day or keep their aligners out for more than four hours a day might be better off wearing fixed braces that can’t be removed at all. Failing to follow these guidelines means treatment will be less effective or will take longer. Wearers of any kind of braces need to be meticulous with their oral hygiene to minimise the chances of tooth decay, gum disease or staining during treatment. Although the Invisalign vs braces debate rages on, there’s no denying the fact that over the past 20 years, more than 4 million patients have now used Invisalign braces for better smiles in 90+ countries. Celebrities who have corrected their smiles inconspicuously include Oprah Winfrey, Keira Knightley, Kate Middleton, Tom Cruise and Justin Bieber. Over the past 20 years Invisalign has invested a lot in research and development so its aligners can now be used to treat 90% of orthodontic cases. This includes some severe misalignment problems which in the past could only have been treated with traditional metal braces. Take a smile assessment to quickly find out if your teeth can be straightened with Invisalign. If you like the idea of less noticeable braces but decide against Invisalign for some reason, there are other options you may want to consider. Ceramic braces and clear braces, such as Damon braces and the ClearSmile Brace, use the same system of brackets and wires as metal braces. The key difference is that the brackets (and sometimes the wires) are made from a material that is tooth-coloured or white. This helps make the braces less obvious, particularly from a distance, but the problem with discomfort remains. Clear braces can be a good alternative for people who are not eligible for aligner brace treatment but still want a straighter smile the subtle way. Another option to consider is lingual braces, which are hardly noticeable as they are fixed behind the teeth. Lingual braces are typically the most expensive type though, and some users find them uncomfortable. If you’re considering dental braces for yourself or your teen, it’s best to visit a dentist or orthodontist who is experienced with using several different types of braces. They will be able to give you a professional opinion on the best type of orthodontic treatment for you. Many adults and teens choose to straighten their teeth with invisible braces because they don’t want people to notice they are wearing braces at all. They also like the convenience of being able to remove their aligners to eat as normal. Of all the brands available, Invisalign is the best known – and for good reason. With over 20 years of expertise, Invisalign has proven its effectiveness and can now be used to treat 90% of orthodontic cases – even severe malocclusions which you might think required metal braces. Find out if you or your teen are suitable candidates for Invisalign braces by completing an online Smile Assessment. It’s completely free and it takes less than two minutes to fill in some details about your teeth. Or, if you’d prefer to speak to someone face-to-face, book an appointment with your nearest Invisalign provider. Just click the button below to search for Invisalign dentists in your area and arrange your first consultation.